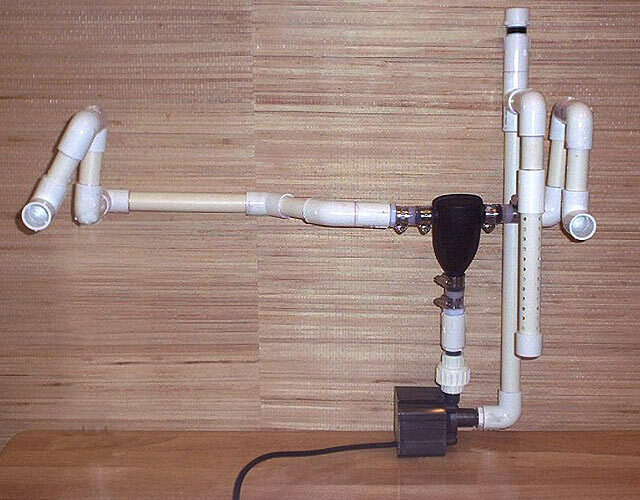 It is hooked up to a Mag 5 pump, with 3/4" thin wall PVC and Schedule 40 connections. 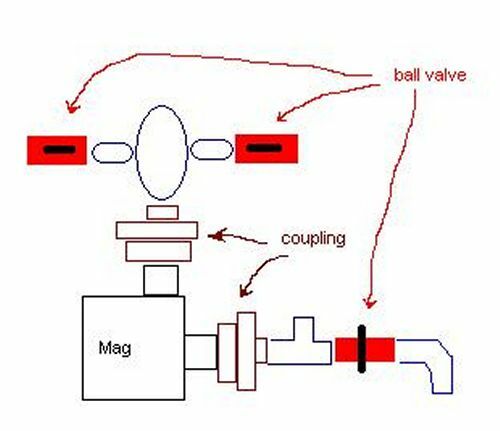 The cap (upper right) is how to prime the pump. Once filled, screw the cap back on. Be sure to use teflon tape on all pipe threads!!! 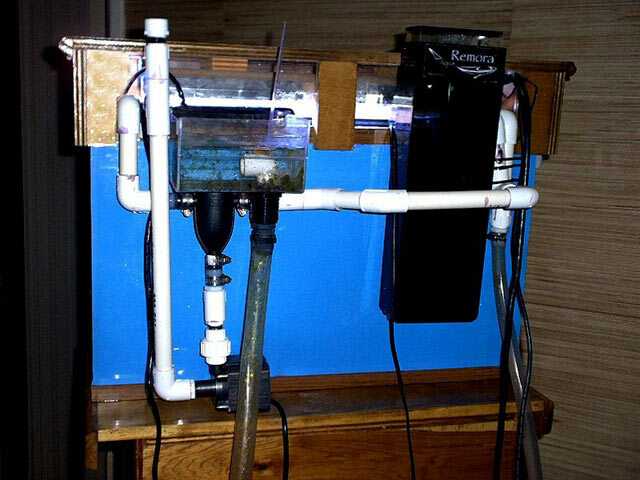 This had to fit a 25" span, around a hang-on-back Remora protein skimmer, and under an overflow box. The pipe with numerous holes drilled in it is my intake. The reason for this was so that if some type of animal were to crawl on it or get sucked against it, it could still pull itself off the pipe and continue on its way. That section is removable for cleaning. The 1/8" holes are evenly spaced every 1/2" for about 9", running up all four sides. 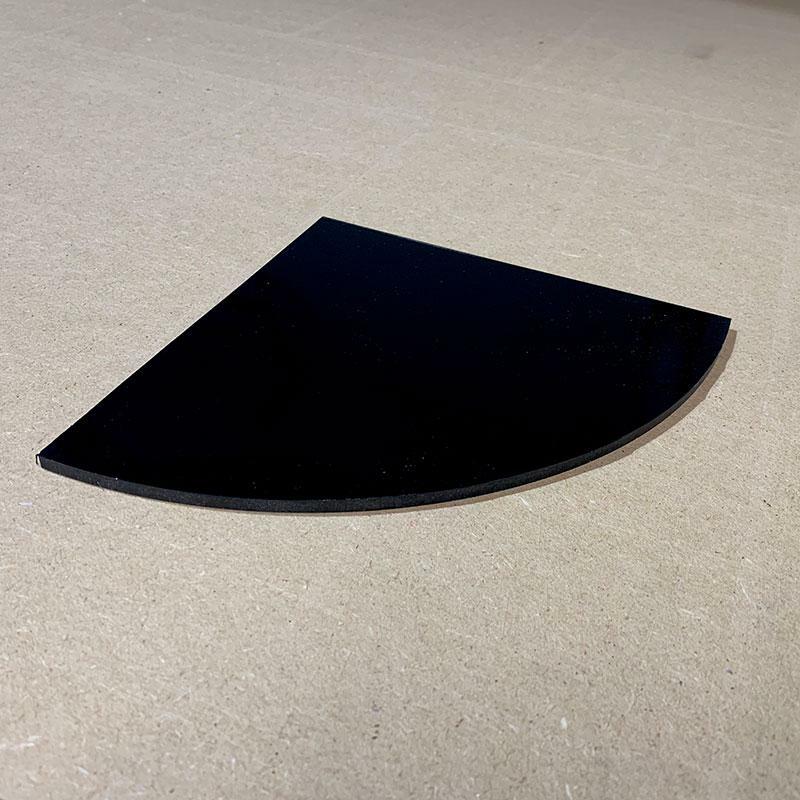 The returns are the only thing not glued on, so they can be turned to direct the flow differently if needed. Everything else is glued firmly to avoid any micro air bubbles. Both returns are in the rear corners. The other return you see near the left front is from my sump & refugium. 2/28/03 - I've been getting quite a bit of email about this project, so I'm going to add more detail. What is that black thing in the middle? What is that thing with the cap for? That is where water is added the first time to prime the unit. Be sure to use teflon tape on those threads to seal it air tight. Turn on the pump, and all the air will be blown out of the lines in the first 10 seconds. You will not need to reprime the closed loop unless you remove the pump or SCWD for maintenance. Even if you turn it off, it will restart as long as you do not remove the cap. Is your unit hanging off the tank? Isn't it too heavy? No, it is not hanging off the tank. I measured it so it could sit on the back of the stand, and the pipes are 1/2" above the backwall of the tank to avoid vibration noise. I thought I'd need a mousepad under the pump to avoid noise, but it wasn't necessary. Would you make any improvements on this setup, now that it is installed? Yes. I wouldn't drill any holes in the returns. They are unnecessary. If the unit is powered off, the water has nowhere to go, so back siphoning isn't an issue. However, let me add that by having anti-siphon holes in the returns, if the pump ever leaks or your plumbing breaks, the tank will not drain lower than those holes. So if you do use them, be sure they are submerged about 1". Also, I would add another coupling to the inlet, as well as a couple of ball valves after the outlets from the SCWD. That way when you do need to remove the pump for servicing, you can close those valves and keep the water in the return lines, unscrew the two couplings and pump can be cleaned. You could easily remove the SCWD as well if it needed cleaning out (or soaked in vinegar water as part of your maintenance). I would also add a 'T' at the inlet with a ball valve on it, to drain the water in the pump before removal. Here's a drawing of these modifications. When I get around to it on my own unit, I'll make the changes and take a new picture, but for now this will have to suffice. Do you have to re-prime the pump when the power goes off? I noticed you are running a Mag pump externally, but I've heard they will leak? I have run Mag pumps submerged and externally. I've not had any leaks, nor any vibration noise. I did see some salt creep, but not enough to take it apart. I didn't touch my closed loop for 6 months, and it ran perfectly the entire time. Here is a good tip for servicing Mag drives when taking them apart for cleaning (maintenance). What about using a Mag 7 instead? 9/30/03 - After running the system with a Mag 5 for six months, I replaced it with a Mag 7 and I'm very happy with the results. The Mag 5 and Mag 7 are identical in size, so no adjustments were necessary. It doesn't sound any different than the Mag 5, and is virtually silent. If yours is a bit noisy, try unplugging the pump for about 5-10 seconds for any trapped air bubbles to rise within the plumbing and plug it back in. I think cavitation might be occuring, and this is an easy fix. 4/07/04 - Want to see a video? 49 seconds (4.2 meg download) While I was changing the water, I realized you could see the flow quite easily because air mixed into the output. 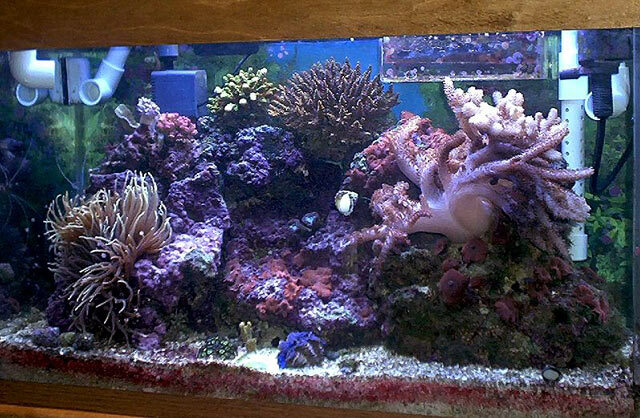 With the tank full, there are no bubbles and the only indication of flow is the movement of my amemone and any soft corals. What sized plumbing should I use? The Mag pump comes with printed instructions that state to double the outlet size to determine the plumbing needed. The Mag 7 has a 1/2" outlet, and the pvc needs to be 1". 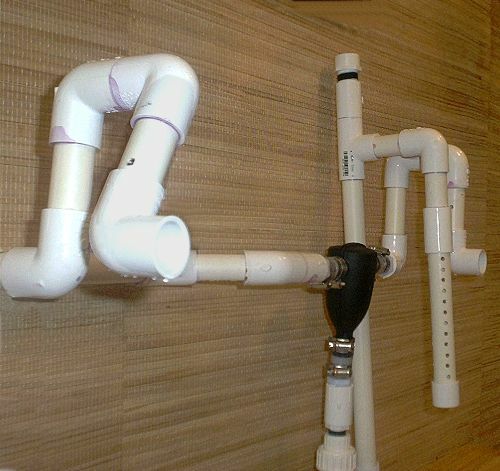 If you use 1" plumbing, you'll get better flow than if you used smaller I.D. (inside diameter) pvc. Now that brings up a new problem, in that you need it to get smaller for the SCWD, and then ramp back up to larger pipe to avoid constriction. So you'll have to find "bushings" or reducers to make things work. Or use larger flexible hose: Slip on a small piece of one size on to the SCWD outlets to act like a small collar, then slip the next size hose over that, clamping it securely. 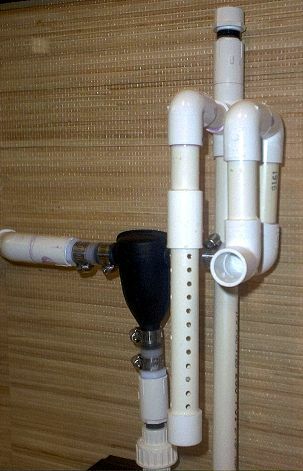 Metal hose clamps can be used in dry areas, but not if the connections are submerged. Here is a picture of the unit installed on the back of my tank. I figured you'd like to see it in action, rear & side view. This is a great solution for in-tank flow, if the tank is drilled or not. The cost of the plumbing, pump, and electricity used need to be considered - you may prefer to use Vortech pumps instead, as these take up very little room in the tank and add diverse flow patterns.